The phrase “project management” is a simple description of a complex activity. Before you can even plan the project, you must get it approved by stakeholders and sponsors. So, you’re sort of a salesman. Then you must plan it, schedule it, budget it, all within the confines of what has been approved. Next, you need to assemble a team to accomplish those tasks, and you must monitor their progress and report back on it to the project executives. And on and on it goes! We haven’t even mentioned the tools you’ll use to manage all the project variables. It helps if you can break down these many components into a dozen key project management principles. That’s just what we’re going to do, and even better, we’ll explain how you can use them when you’re managing a project to better ensure a successful end. Even before you manage a project, you must commit yourself to success in that endeavor. Your goal as a project manager is the successful completion of the project. This isn’t merely about keeping the project on schedule and within budget. Many a project has come in on time and with money to share, but the goal was never fully achieved. That is project failure. Projects are set to fail if they’re not lead by a project manager. The project manager comes up with the plan to achieve the goals of the project, and they manage the team assembled to complete those tasks. You, as a project manager, are responsible for getting the sponsors on board, communication, risk management, budgeting, scheduling, the whole kit and caboodle. Therefore, you want to have a skill set that includes technical knowledge, managerial experience, interpersonal skills and so much more. The most important thing to remember is never become complacent, always be learning. Are you committed to the project? You better be! But so must every other person involved in the project. You must have the sponsor and the team on board, too, or else you don’t have a viable project. This commitment is crucial before the project is even planned, yet alone executed. By commitment, we mean an agreement on project goals and objectives, scope, quality and schedule. Once you have these you’re ready to work. This is the first thing you’ll have to think about when managing a project. The structure will basically stand on three pillars: your project goal, resources and time. What you must know is the reason for the project, which might seem obvious, but this question defines the project and leads to its structure. The next step is understanding how long it will take to accomplish that goal, so you’ll want to have a timeline that’s broken up by milestones, marking major phases in the project. You have a structure, but you must move into the definition phase to fully grasp the project. That’s a principle often passed over at the expense of the project. It’s easier said than done, however, with many voices offering differing opinions of what the project is. Your job as project manager is to make it clear what the project is about, which can be problematic when there are many stakeholders. Defining the project is not a one-time event, but something that must be revisited throughout the project. You must make sure that everyone, especially your team, has a clear definition in mind so they can work productively. By transparency, we mean that you must report on the progress of the project to your sponsors and stakeholders. You can’t hide anything from them, or at least you do at your own risk, for it’ll inevitably come back to haunt you. Of course, your sponsors and stakeholders don’t need you to drown them in minutia about the project. They want to see the broad strokes regarding progress, budget and schedule. Save the details for your team. Yes, you must be transparent with your team. They need reports too, but you want to have those reports customizable to create effective reports that hits the target audience for whom they’re intended. While reporting to the various participants in the project is key, there must be a primary communication channel between yourself and the project sponsor. This is the only way to ensure that project decisions are properly implemented. Without having a singular way to disseminate what the sponsor wants to the project manager, you’re not being efficient or effective in administrating the project. Even if there are multiple sponsors, they must speak with one voice or risk sending the project into chaos. You have the responsibility to set this line of communication in place, finding the right person, with the right skills, experience, authority and commitment in the executive team to facilitate this important task. To progress in a project, a project must have well-defined roles, policies and procedures in place. That means that everyone must know what they’re responsible for and who they answer to. There needs a delegation of authority for any project to function. It also means that you must have thought out how you’re going to manage the scope of work, maintain the quality of the project, define its schedule and cost, etc. Without these things being figured out at first, you’re putting the project at risk. The life cycle of a project are its phases, from planning to initiation, monitoring to closing. Each phase of the project is dependent on planning it and then doing it. Milestones determine the start and end of these project life cycles. You can think of them as signposts on the drive to reach your project’s destination. For a project to work, you must have a culture that supports the needs of all those involved. It might sound like mollycoddling—this is work, after all—but you don’t want anything to disrupt the effective productivity of your team. A supportive work environment means a project team that is going to work better. As project manager, you must understand this dynamic and have it backed by management on all levels. Style is substance in this case, so make sure the management style is suited to the project. Risk is part of life, and it’s certainly a part of any project. What you must do is, before the project even starts, figure out what are the potential risks inherent in the work ahead. Identifying them is a not an exact science, of course, but you can use historic data and knowledge from you, your team and sponsors to uncover where risk lies. Using a risk register template helps you capture all this information. It’s not enough to just know that risk might rise at this or that point in a project, you also should put in place a plan in which to resolve the issue before it becomes a problem. That means giving each risk a specific team member who is responsible for watching out for it, identifying it and working towards its resolution. Naturally, you’re not going to foresee every risk, hopefully you’ll have at least identified the big ones. That’s why you must have an eye out for any irregularities. Have your team trained to be your eyes and ears on the project front. The sooner you identify a risk, whether expected or not, the faster you can resolve it and keep the project on track. As you progress through your project, you’re going to need a metric to measure success. This is how you can hold your team and yourself accountable. Therefore, you want to have ways to measure the various aspects of your project and determine if the actual figures reported are in line with the ones you planned. The great thing about accountability in a project is that it gives you the means to identify those team members who are top performers. They can then be rewarded. Everyone likes acknowledgement. While the underachievers can be given the training or direction they need to get more effective in their performance. There are more principles to project management. The list might even be endless, but these give you a roadmap to success. But you can’t get there without the right tools for the job. 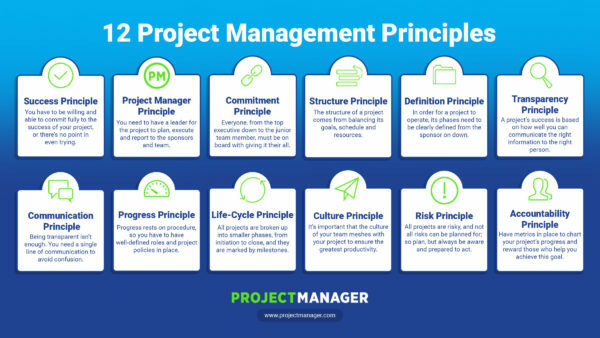 The cloud-based software of ProjectManager.com has the features you need to implement these principles through every phase of the project’s life cycle. Try it out yourself for free with this 30-day trial, and see how it can help make your job easier and increase project productivity.